Summer is in full swing and so are the village feasts that are celebrated around the Maltese islands. During the year, especially during the summer months, towns and villages around Malta celebrate their locality’s feast in honour of their patron saint. But there’s no feast without celebration and music. 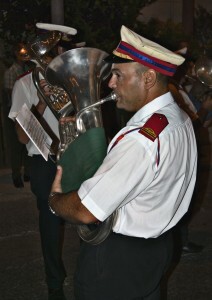 Band clubs in Malta are part of the social and cultural history of the Maltese islands. In fact most of the towns and villages in Malta have their own band club. 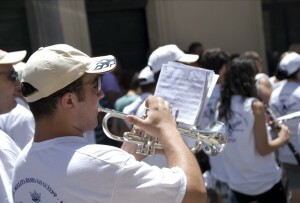 Its aim is to spread Maltese culture and to teach music to the local community. Many musicians who have gone on to make a name for themselves, locally or abroad, owe their success, in part, to the encouragement and teaching of the local band club. These philharmonic societies or band clubs, originated way back in the second part of the 19th century. With the financial support of local businessmen, individuals who possessed the talent to learn how to play an instrument bought a musical instrument and started learning, with the primary aim of performing in the village feast. By time, the number of band clubs flourished and a Band Clubs Association was formed. This year the Association is celebrating its 60th anniversary, endorsing a membership of 84 band clubs across the island. According to the latest survey by the local National Statistics Office, the total number of bandsmen/women (bandisti) amount to over 4,000. Every town and village in Malta and Gozo has its own band club, some even have two, as there are certain villages which celebrate two feasts – one dedicated to the patron saint and the other celebrating the so called ‘secondary’ feast of another saint. During feast time competition is at its max, where each band club strives to be the best, decorating the façade of the club’s premises in the most colourful and vivid way, launching new musical numbers, and creating the most merrymaking atmosphere possible. Marching in rows of six, wearing uniforms and proudly showing off the badge of their club, a band is normally composed of between 60 and 70 bands-men/women playing a variety of instruments. 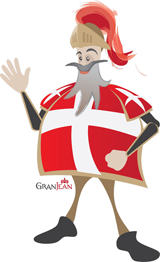 During your summer holidays in Malta enjoy a typical Maltese feast and be part of the local festivities. And whilst staying at this superior 5 star hotel in Malta be sure to ask Our Concierge for assistance in planning your excursions and for recommendations on places to visit. Photos courtesy of www.viewingmalta.com, Mario Galea and Clive Vella. 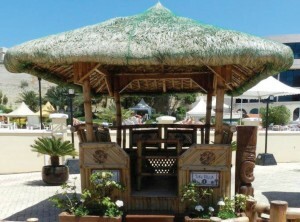 This entry was posted in 5 star hotel malta, About Malta, Excelsior Hotel Malta, Feasts in Malta, Holidays in Malta, Malta Attractions, Malta Events, Malta Feasts, Maltese Traditions and tagged 5 star hotel in malta, band clubs malta, places to visit in malta, summer holidays malta, village feast, what to do in malta on July 29, 2014 by Denise Camilleri. Did you enjoy this year’s Isle of MTV Malta concert? Malta was definitely buzzing with energy. 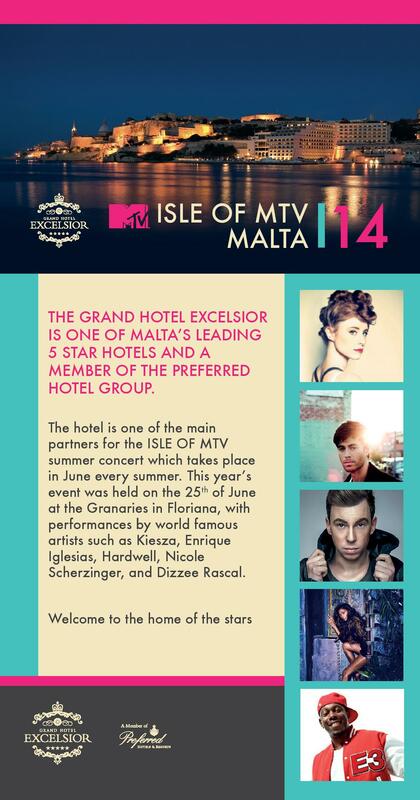 The Grand Hotel Excelsior is honoured to be one of the partners in this well-renowned annual summer concert. If you enjoy visiting Malta for your holidays, stay updated with all year round events taking place in Malta by visiting the website of this luxury 5 star hotel in Malta. This entry was posted in 5 star hotel malta, About Malta, Concerts Malta, Excelsior Hotel Malta, Holidays in Malta, Isle of MTV Malta Special, Luxury Malta Hotel, Malta, Malta Events, Things to do in Malta, Valletta and tagged 5 star hotel malta, concerts, excelsior hotel malta, grand hotel excelsior malta, isle of mtv, malta events, summer on July 10, 2014 by Denise Camilleri. This summer season, the Grand Hotel Excelsior has launched the Tiki Village as its newest breath-taking venue by the water’s edge. The Village has been set up close to the Hotel’s Marina, so guests can revel in stunning harbour views while relaxing in a beautiful and exotic ambiance. The Tiki Village is comprised of 10 Villas, which can be rented out by guests, and its unique Blue Ocean Bar. Each Villa seats six people and additional seating is available within the venue. Guests can enjoy light snacks at lunchtime, and delicious platters will be served in the evening. 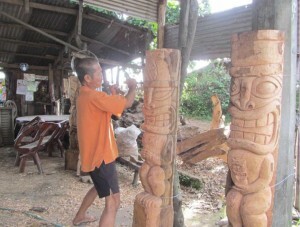 The inception of the Tiki Villas took place in The Philippines when the hotel owners visited self-employed carpenters who earn their living by producing indigenous products. The base of the Villas is comprised of bamboo, while the roof is made of Nipa, a species of palm native to the coastlines of the Indian and Pacific Oceans. Indeed the Villas are typical to the style of carpentry commonly used in The Philippines. By opting to purchase the Villas from self-employed carpenters, as opposed to buying mass-produced products, the Grand Hotel Excelsior is able to offer a more authentic experience to guests. Furthermore the hotel is promoting Fair Trade whilst assisting workers in The Philippines to make a living and improve their quality of life. It is a shining example of Sustainable tourism put into practice. The Grand Hotel Excelsior is a luxury 5 star hotel in Malta on the doorstep of Valletta, Malta’s capital. Stay updated with what’s happening at the Grand Hotel Excelsior and other events taking place in Malta. This entry was posted in 5 star hotel malta, About Malta, Excelsior Hotel Malta, Excelsior Hotel Marina, Luxury Malta Hotel, Malta, Malta Restaurants, Maltese Islands, Mediterranean, Outdoor Dining Malta, Things to do in Malta, Valletta and tagged 5 star hotel in malta, grand hotel excelsior malta, hotel marina, malta events, outdoor dining, sea views, sustainable tourism on July 8, 2014 by Denise Camilleri.